Dr. Chu is a true native Texan! He grew up in the Houston area until he attended the University of Texas at Austin (90-93). 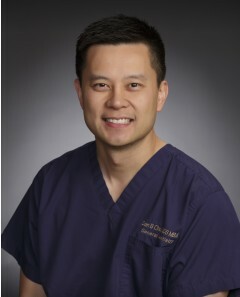 He then graduated from Texas A&M University Baylor College of Dentistry in Dallas (93-97) and obtained his MBA from Texas Tech University in Lubbock (09-11). He also attended a rigorous General Practice Residency program in New York City at St. Barnabas Hospital in Bronx, NY (97-98). His staff takes great pride in their care and understanding of the needs of their patients. They have been specially trained to assist patients in their pre-operative evaluations and insurance pre-determination. Dr. Chu's team is well versed in answering patient questions and complimenting the doctor's high level of care and concern.